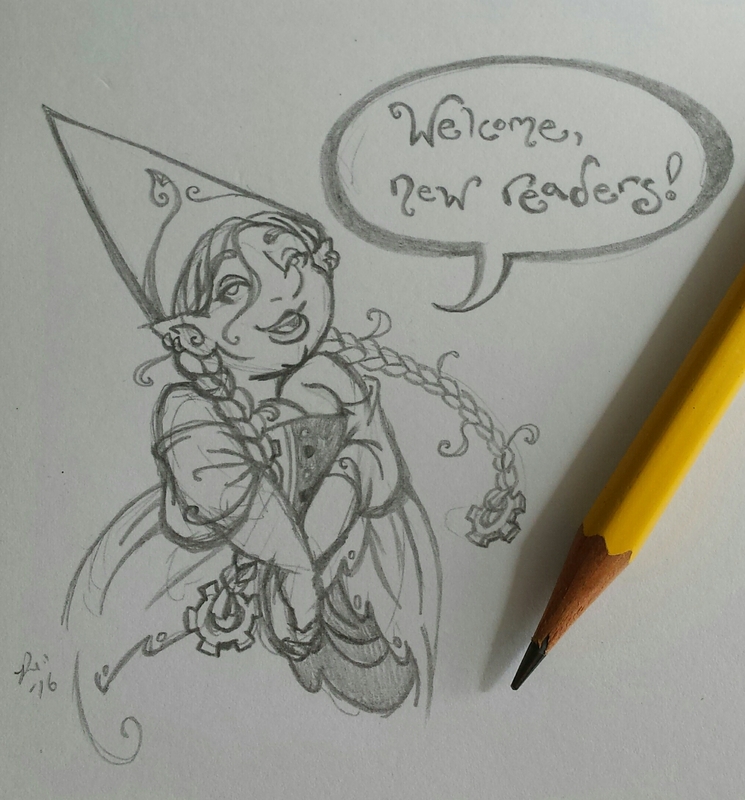 Once upon a time, a young aimless illustrator submitted various drawings to an indie magazine called “Crossed Genres.” They had an open-submission policy that paid artists when their submissions were for publication, so it seemed like a good deal. Unfortunately this was many years ago, so a certain….. skill level was lacking, and the illustrator did not get accepted. Still, she tried, and the people who ran the magazine were very nice and encouraging to her. A while later, this magazine saw fit to hold a competition – seeking webcomics! If accepted, the chosen comics would be published online for their members, one page a week for 52 weeks, and then published in print in one big compendium. Even though I hadn’t gotten any of my illustrations accepted, one particular member of their team reached out to me (whoops, dropping the vagueness) and encouraged me to submit a comic. I honestly don’t remember WHY I chose to submit – I was actually at a rough patch in my life, so perhaps I thought that creating a comic would fill a certain hole in my spirit. But that’s a different story. Anyway, I did choose to give it a shot, but then the question was – about what? My wife is very good at asking questions to get at the root of what I want to express with character and story, so when I came home that afternoon with that decision – the questions began, and Tock was born. I came up with the vague description of the plot, with a couple of character designs and example images as instructed for submission. However, without realizing it, I had censored myself – as you can see, Tock and Onna look a bit different from how they truly are. Due to my own worries about how the characters would be perceived (by the people in charge of picking the winning submissions, particularly), I thinned Tock out – so much for my size-positive mission. And in my excitement I didn’t think about why a “warrior class” person and a “mage class” person would look the way they do – so Onna’s fantasy armor looks very generic, and I didn’t have much of a reason for why Eunan wears robes like that. I did not get chosen Retrospectively, I can see why – not only did I hold myself back in character design, but the kind folks who were interested in me enough to encourage me could see that AND that I didn’t push the story as far as I could have. Again, they were super nice about it though, even so far as to say that to me so I could learn from it. That rejection did hurt, but you know what happened? I did it anyway. Tock got redesigned – slight tweaks, but still noticeably more well-rounded (both metaphorically AND physically, as you can see!). Onna got the biggest overhaul of all – I actually went and thought about what kind of armor she would have, as an Orc in her kind of culture (nomadic, almost scavengery at that point. The Viking details came later). Bumble didn’t change at all, and Eunan’s robes slowly evolved into a more Celtic design – so still very magey, but with a reason. The story itself also got expanded. 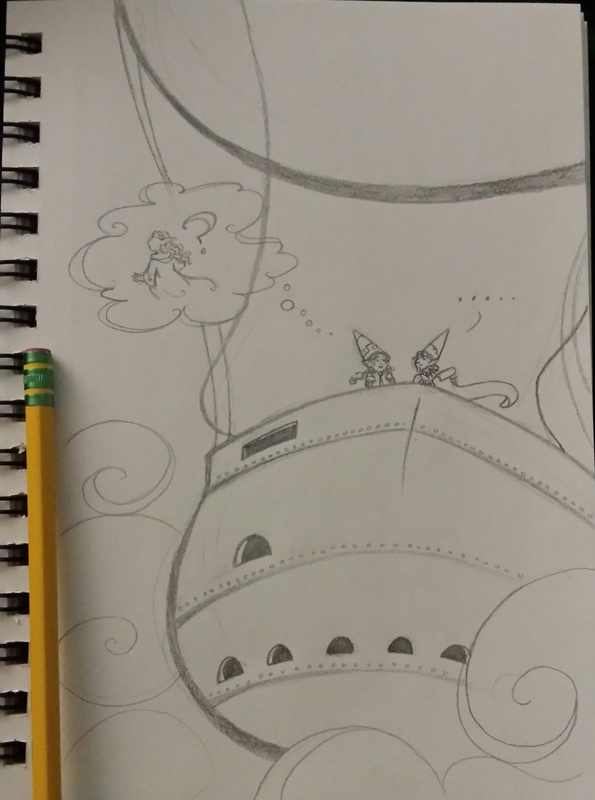 Certain details – like an early idea of Onna getting magically shrunk down to Tock’s size to better accommodate their romance (I know, yikes, right? ), and a secondary plot about the current Gnomish princess, eventually got scrapped – I looked farther out than the scope of Tock’s quest to see what else is really going on with the world, and why her quest might have importance BEYOND her own, selfish motivations. The plot of the quest itself was adjusted to incorporate a greater vision – new characters were added, certain old characters of mine were pulled in to give the world history, and voila! A much more solid story slowly began to take shape. Page by page and bonus content by bonus content, things have still been evolving and growing. The importance of some side characters increased, and another new crew member was added to address the treatment of a certain beleaguered best friend, rounding it out from 4 to 5 (which flows better, in my opinion. I always felt like something was missing at 4. And also thanks to my lovely wife, who is very much inspiring Actia’s creation and actions). More and more the cultures of the world have been developed, the perfect match of Vikings and Orcs eventually smacked me upside the head, Gnome culture and religion grew to encompass a fuller pre-quest life for Tock and Bumble – and also to point out problems with how the Gnomes view life, in addition to the wars and conflict that have already been mentioned world-wide. My own spirituality has been informing the comic more and more, too, so how very Faerie the world is has drastically shifted – I didn’t plan on actually addressing how faerie-natured all the creatures of Tock’s world are, originally, but now that has become a huge part of the story and an informing factor of any of the foreshadowing we’ve seen so far. I guess all I can say in closing is that I’m very grateful for how far the story has come, that I didn’t just give up on it – and even more importantly, that you all have stuck with it for so long! Gratitude from the bottom of my heart once again, dear readers! And happy Seven Years of Tock! Dedicated to anyone newly visiting from “Gnome and Fairy Fest” this weekend! Thanks for your support, and I hope you enjoy Tock and her story! Also, linework for page 69 is done, colorwork started today. Huzzah!